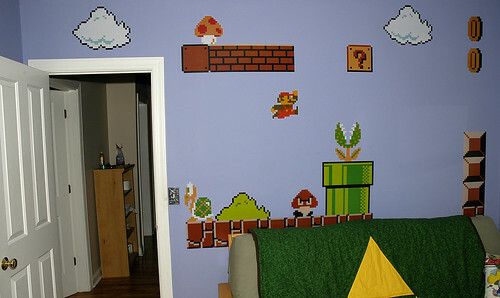 After posis_das moved out a month or so ago, sokay and I agreed to turn his old bedroom into a guest bedroom / classic gaming room. There's still a lot more that I want to do with it, but it's finally at a stage where I can sit down and play some Mike Tyson's Punch-Out!!. A mural we decided to put up on the wall. The stickers are from ThinkGeek, and were a gift from underwhelm and gawm. I think they look fantastic. This might be the coolest poster... ever. 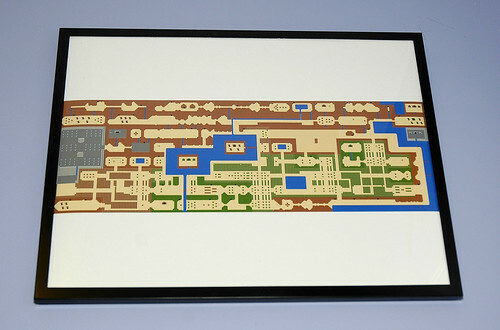 It was a Nintendo Fun Club, erm, Club Nintendo reward. I liked this poster so much that I had a frame custom-made for it. Who the heck makes a 16.5625" x 28.625" sized poster, anyways? 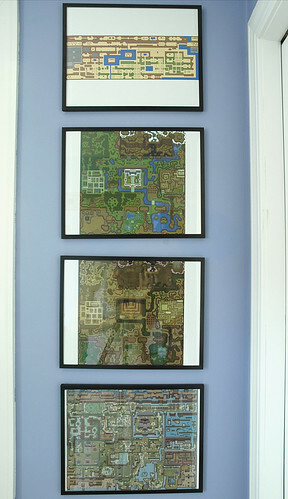 A set of maps that I had printed out. 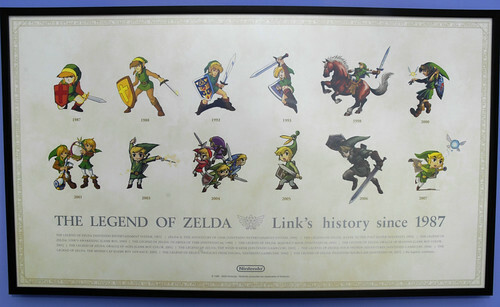 They're from The Legend of Zelda, The Legend of Zelda: A Link to the Past (both Light and Dark World), and The Legend of Zelda: Link's Awakening. And here's one map, up close. 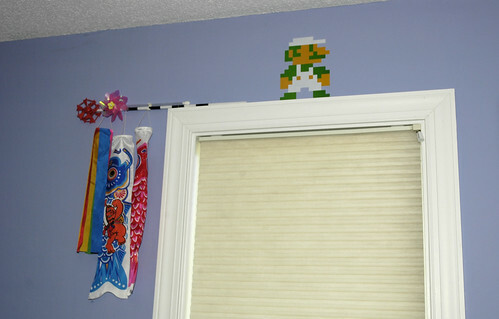 Luigi hanging out above the window silly. To the left is a koinobori, a decoration typically put out in Japan in honor of Children's Day. To the right (not pictured), is a Power Star, above the closet door. 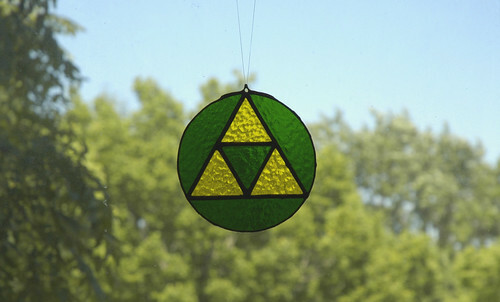 A triforce stained-glass suncatcher that I made a year or so ago, hanging in the window. And the main event - the games themselves. 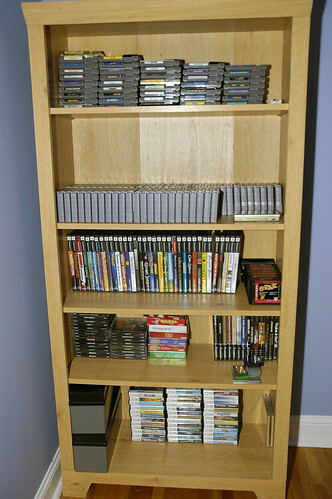 NES, SNES, PS2, Genesis, PS1, Dreamcast, GBA, Gamecube, Xbox, and DS. Was nice to take these out of storage and actually put them on the shelves. 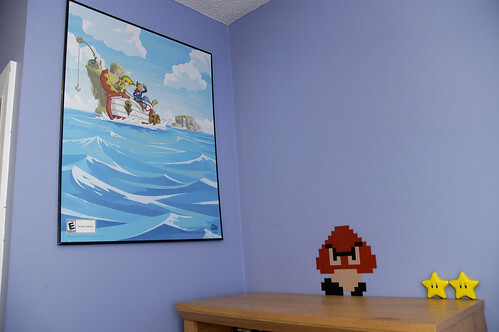 A poster from The Legend of Zelda: Phantom Hourglass, and a Goomba hanging out on top of the bookshelf. Have you ever noticed how angry they look? He looks pissed! Erm... is it a he? Do Goombas have a gender? And how do they reproduce? And the video game systems. 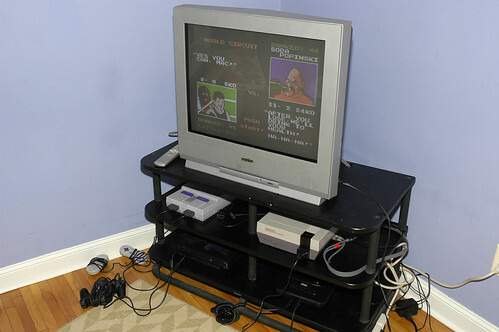 Got a NES, SNES, Genesis, and PS2. Hey... wait. Is that Soda Popinski? I hate that guy! Kirby hanging out on the futon. 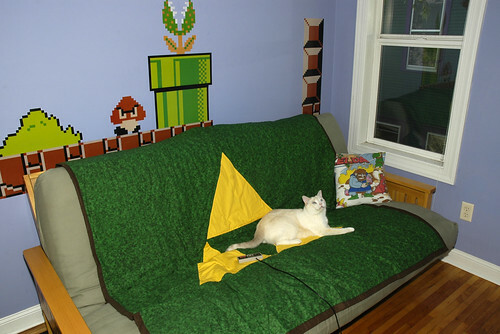 You'll notice that it's covered with a totally sweet handmade Triforce blanket that was a gift from kizdeana. It's awesome! Also, there's a Zelda pillow that I picked up on Etsy. 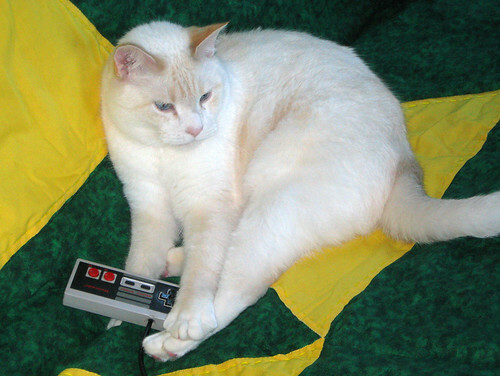 Even kitties love playing on the NES! Kirby's a big fan of Kid Icarus, just as long as he isn't getting turned into an eggplant. So, anyways, that's the room. I think it's a TKO from Tokyo. Or am I just lucky to have a spouse that surely wants to play some Dr. Mario? Ulterior motive uncovered! Wow! That is wonderful! I absolutely LOVE IT. You really need to post this in saucydwellings. They would eat this up with a spoon.